Free Printable World Cup Matching Worksheet. 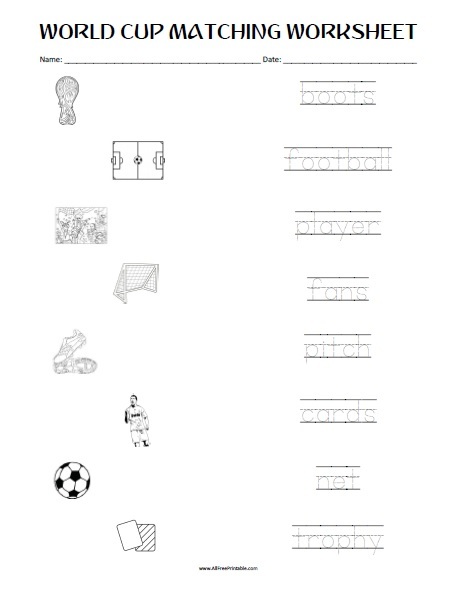 Free Printable FIFA World Cup Matching Worksheet, great for kids to have fun and practice writing skills. Share this free printable Football World Cup Matching Worksheet with all the little soccer fans, kids, and students that need some handwriting practice. Your kids can match the World Cup images with the correct name and then practice writing skills. Kids can match 8 words like pitch, player, football, net, trophy, boots, fans and cards. Print or download this FIFA World Cup Matching Worksheet free.